Inhabited for thousands of years, the gorge of Samaria has a played an important role as a place to flee from the oppression of foreign invaders. Its geographical location, in the middle of the White Mountains as well as the ease with which it could be defended made it the ideal place for this purpose. Terracotta fragments and some votive offerings discovered near the chapel of Agios Nikolaos indicated that there was a sanctuary of Apollon located in the vicinity but little more is known about it. The ancient city of Tarra which stood on the site now occupied by Agia Roumeli is better documented: it was one of the '100 cities of Crete' of which Homer tells us. Archaeological excavations indicate that Tarra existed as far back as the Late Minoan period (there is a stone column with a double-axe in the museum in Chania). Tarra had formed an alliance with some other ancient cities of the South coast, minting their own coins, and exporting wood to ancient Egypt, Mycenae, Knossos and Troy where it was used to build palaces and ships. The city was particularly important in the Roman period although it was destroyed in 66 AD when the south-west coast of Crete rose by over 3 meters. Tarra lay on the sea route from Rome to Egypt and the East and this contributed further to its prosperity. The city went into decline in the 6th century AD when the wheat trade between Egypt, Rome and Constantinople became less important. During this period of prosperity the inhabitants of Tarra became ship-owners - building their vessels with their own timber - and engaged in piracy. These activities came to an end in the 7th century. Among the possible reasons for the decline of Tarra are the raiding and looting of the Arabs, a change in the sea routes and earthquakes. The village of Samaria was first inhabited during the Byzantine period. In the 14th century members of the Skordilis family from Hora Sfakion moved to the village.The saying has it that the reason for this move was that the commander of the Venetian guard at Sfakia had tried to kiss the beautiful "Chryssomaloussa" (something like "Goldilocks"!) and when she resisted he hacked off one of her tresses with his sword. To avenge the insult, the Skordilis family wiped out the entire Venetian garrison and their commander. The Venetian tried to force their way in the gorge to punish the Skordilis family, but in vain. In the end, they had to make an uneasy peace and the beautiful Chryssomaloussa became a nun in the convent of the Blessed Mary of Egypt (Ossia Maria) in Samaria. Throughout the period of Venetian rule the gorge was a haunt for freedom fighters. After the failure of an uprising in 1570, Provedatore Marino Cavalli ordered the destruction of Sfakia. In the early years of the struggle against the Turks some of the most important events in Cretan history took place in the vicinity of the Samaria gorge. In 1770, during the uprising led by Daskalogiannis of Anopolis, 4000 women and children being pursued by the bloodthirsty Turks took refuge in the mountains, most of them in the Samaria gorge. They were saved by the stout resistance of Giannis Bonatos whose forces of 200 men held the Gates and eventually forced the Turks to retreat. In 1821, the whole of Greece rose in revolt, unsuccessfully in the case of Crete, and once again the defeated revolutionaries were forced back in the gorge. Again, all the Turks efforts to capture them were in vain. In the great revolt of 1866, Omalos, the Samaria gorge and Agia Roumeli were mustering points and places of refuge. Supplies were being send from the mainland of Greece. A provisional government was even formed in Agia Roumeli. In 1866 Mustafa Pasha sent three warships to bombard the foodstuffs and military supplies warehouses and the shore at Agia Roumeli where many had congregated in the hope of gaining passage to mainland Greece. The first Turkish boarding party was repelled after a fight lasting several days. 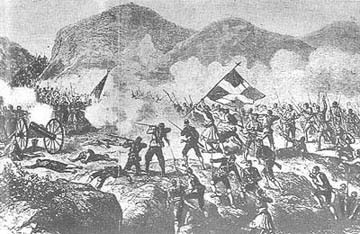 In July 1867 Omer Pasha landed 4000 troops and the Cretans were forced to blockade themselves in the gorge, taking as many supplies and ammunitions as they could and setting fire to the rest. The Turks failed to gain entry to the gorge and burned Agia Roumeli instead. By 1869 all of Greece was back again in Turkish hands with the exception of the Samaria gorge. During the WWII occupation of Crete by the Germans the gorge of Samaria was also playing an important role in hiding partisans and allied undercover units who were dispatching information by radio to their Middle East Headquarters. They attempted to capture the radio equipment on numerous occasions without success.